Does Dunning Sand & Gravel sell just what the name implies, sand and gravel? No, we have a wide variety of products and we're always looking for additional products in order to meet or exceed our customers' needs. We do sell a variety of specialty sands. For instance, we sell mason sand, concrete sand, septic sand, ball-field clay, pool sand, and pipebedding sand. And we sell aggregate (gravel and sand) ranging from 1/2 inch washed stone to 6 inch River Jacks. However, we also carry different kinds of topsoil, different colored stones and different colored mulches, and hundreds of hardscape Belgrade, Cambridge and CST pavers in all shapes and sizes that are used for patios, walkways and even driveways. We also provide services for our customers like mobile crushing. This involves bringing a large crushing processor to a municipality's public works yard and crushing old asphalt and concrete right on site. They no longer have to haul this old road material to us. Do you still consider Dunning to be a sand and gravel company? No, we consider it to be a materials company because our products go beyond sand and gravel. We also could be considered a recycling company because an increasing number of our products are developed from recycled material. For instance, our mulch comes from recycled wood. Our topsoil comes from recycled fill taken from construction sites. While we continue to mine for some of our products, we recognize the source of these products is finite. Rather than go out of business in 10 â€“ 15 years because our products are no longer available, our business plan calls for us to do more and more recycling. Itâ€™s good for business, but the added benefit is that it's also good for the environment. What are you planning for your next innovative product? The products aren't as innovative as the process is to produce them. 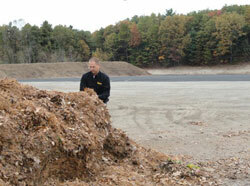 For instance, we are composting leaves collected by the Town of Farmington and by area landscapers. Composting isn't new; it's been around for many, many years. However, the process we use eliminates odors and cuts the composting time in half. The result is a rich topsoil that can be used by home and commercial gardeners, landscapers and farmers. We're also recycling asphalt into a product called â€œmillings.â€ When a paving company rips up damaged asphalt, preparing to replace it with new pavement, they bring the used, crushed asphalt here. We process it into millings. The millings can then be reused and the result is pavement as good as new. Our wood recycling involves processing old logs, used pallets, old tree stumps â€“ essentially any untreated wood - into mulch. We add non-toxic, naturally occurring dyes to produce different colored mulch. Our asphalt shingle recycling process allows roofing contractors to bring the old shingles they rip off roofs to Dunning. We then process the shingles, reducing them to a fine, crumbly substance that we sell to asphalt manufacturers. They, in turn, melt the substance in order to liquefy the petroleum, an ingredient of paving asphalt. At Dunning, nothing goes to waste. We will figure out a way to process or recycle almost anything. So is Dunning also a "green company?" Absolutely! Our recycling processes allow us to create products without harming the environment. In addition, the organic topsoil we develop from composting leaves will meet the stringent requirements of the "gold standard" of green building - Leadership in Energy and Environmental Design (LEED) certification of the U.S, Green Building Council. Contractors and landscape architects who are building LEED certified projects will be able to get their topsoil from us. How active is Dunning's hardscape business? Very! We introduced our hardscapes several years ago to offer yet more products to our residential and our landscaper customers. We carry three lines of hardscapes - Belgard, Cambridge and CST. Many of the paving stones are relatively small, say six inches by six inches. However, some are very large and very heavy. The paving stones are used for garden decoration, for walkways, driveways, patios, and for swimming pool areas. Many can be installed by homeowners, but if the homeowners prefer to have a landscaper complete their project we can provide photos of some of the work done by our customers who are landscapers. Your hardscape showroom is actually outside now. Do you have plans for an inside showroom? Yes, we plan on converting the nearby building where Farmington Motor Sports is currently located at 163 Brickyard Road into a hardscape showroom. We own the building and Farmington Motor Sports is planning on moving anyway to another nearby location. The building is strong, capable of handling the weight of many tons of hardscape pallets. However, there is also room for special equipment to hoist and strategically break and customize very large, multi-ton pieces of hardscapes. Why do you do mobile crushing? It's another way of providing good customer service. This is used for many municipalities whose public works crews rip up the pavement from old, damaged, pot-holed roads. The crews pile this asphalt and concrete at the public works yard, which usually has limited space. So we bring our crushing machines to the public works yards and recycle this material for them on site. It saves them significant transportation/h costs and they can use the recycled asphalt and concrete as a base material for new roads. Do you have any other new customer services? Yes, we have begun site contracting. So instead of coming to us for the raw material for things like new septic systems and athletic fields, customers can also contract with us for the design, development and installation of these systems and fields. We have become a one-stop shopping location. What do you want Dunning Sand & Gravel to be known for? Excellent customer service and superior products at reasonable prices!